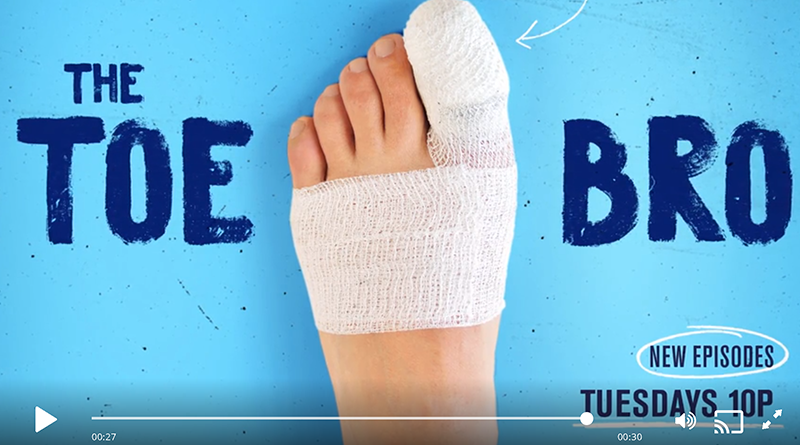 I recently watched the first episode of the new A&E reality show The Toe Bro entitled Toezilla that was released on March 5, 2019 and felt compelled to review it. The show is a well-produced reality TV style show that follows Toronto suburb chiropodist Jonathan Tomines as he treats his patients. This foot care-centered show follows on the heels of the similar styled TLC Channel reality show Dr. Pimple Popper that follows Upland, California board-certified dermatologist Sandra Lee, MD as she lances boils, pops pilar cysts, and busts blackheads. 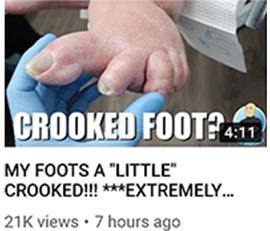 I’ve also been made aware of a new TLC Channel show focusing on two foot surgeons in Orange County California called My Feet Are Killing Me, which I plan to review next week. As reality shows, all use a variety of video production techniques to sensationalize what is presented. 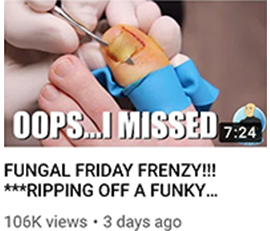 Both The Toe Bro and Dr. Pimple Popper stress the “disgusting” factor, while also highlighting the very compassionate, empathetic, caring medical treatment that they provide. They both grew out of YouTube channels that became enormously successful and widely followed. The Toe Bro channel has over 400,000 followers and has had over 100 million views. The popularity of this first podiatry reality show channel is undisputed. Honestly, the only place you’ve ever seen so many matricextomies, callus and ulcer debridements, and wart excisions is in your own podiatry office! These videos have gotten anywhere from a hundred thousand to millions of views. He’s actually still doing these, posting new ones as recently as today. As of March 5, the A&E network has literally brought the show into the big leagues, morphing it into a very high production value reality TV series and committing to producing six episodes. 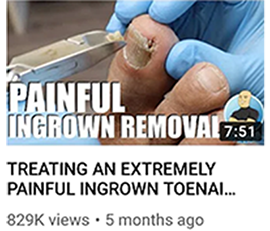 They promote the show with snarky language like, “warts, pincer nails, and strange embedded objects, The Toe Bro has seen and treated it all” and “…there is nothing he won’t clip, slice, or scoop until suffering is a thing of the past.” These oddly satisfying and cringe-worthy procedures, combined with Jonathan’s friendly bed-side manner, leave patients with newfound confidence and viewers fascinated by his achievements. It’s a reality show and chiropody has its first reality star. I watched this episode with mixed emotions. I cringed at the focus on the disgusting factor, was annoyed by the sensationalist style, but Jonathan Tomines impressed me as a compassionate, caring chiropodist that has some good techniques. Like many reality shows (The Voice, Project Runway), The Toe Bro does the back story on the patients, showing a dancer with a painful ingrown nail in her studio, an elderly shut-in diabetic man in his apartment that he hasn’t left in six months, so that you develop a compassion for them. They describe how their foot pain is affecting their lives and you feel for them. Then Jonathan treats them. I should mention that his office looks beautiful, well designed, modern, stylish, and high tech. He does matricectomies on the dancer, he does a nail debridement on the diabetic with vascular insufficiency and pincer nails that literally has the man blessing him, and arguably prevents the kind of foot infection that threatens the limbs of patients like this. Along the way, Jonathan educates his patients and the audience, and though I found some fault with his teaching, it was mostly good advice. What A&E added was some genuinely beautiful stock “footage” of pretty feet being caressed by rolling surf, toes in the sand at the beach, a young child walking barefoot with his father. They also added high production value to the entire show. This may be chiropody but it is all slickly presented….and it does effectively elicit an emotional response from its audience….most consisting of “uchh!” from the ugly toes and the pus, and “aw”s when he genuinely provides compassionate care and pain relief for his patients. What Does This Show Mean to American Podiatrists? All of this has debuted at a time when a general discussion is going on in the podiatry world about our identity. We’ve had “Is Podiatry a Surgical Specialty or is Surgery a Sub-Specialty of Podiatry?” then, “Is Podiatry a Surgical Specialty? 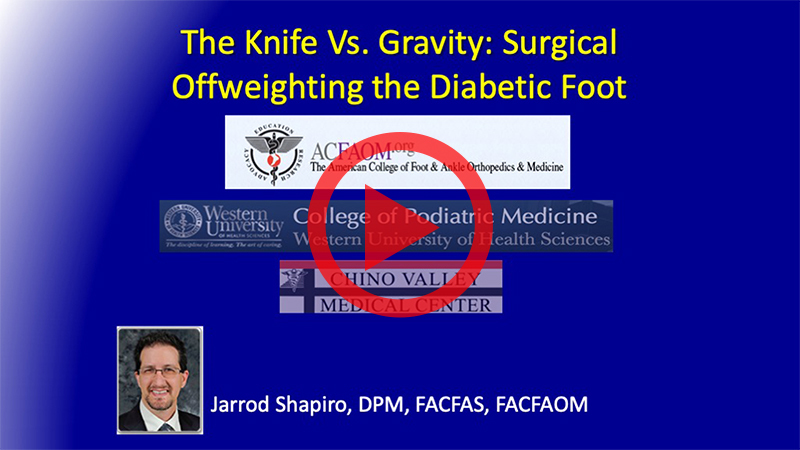 – A Response” then, “A New Direction in Podiatric Residency Training – Dual Track Third Year” then, “Further Discussion on Whether Podiatry is a Surgical Specialty, and Whether We Should go to a Dual-Track Third Year in Podiatric Residency Programs”. To be perfectly fair, we know that there are more than a few podiatrists practicing chiropody very much like Jonathan Tomines in the United States, in some cases with more and some cases less technique and charisma. One big distinction is that we in the United States have all completed graduate training program, we are all doctors, and we all prescribe medicine. We are all doctors. There should be no doubt that American podiatrists are much better trained than Canadian chiropodists. But is what Jonathan Tomines does in his reality series a part of American Podiatry practice? Yes, it certainly is. 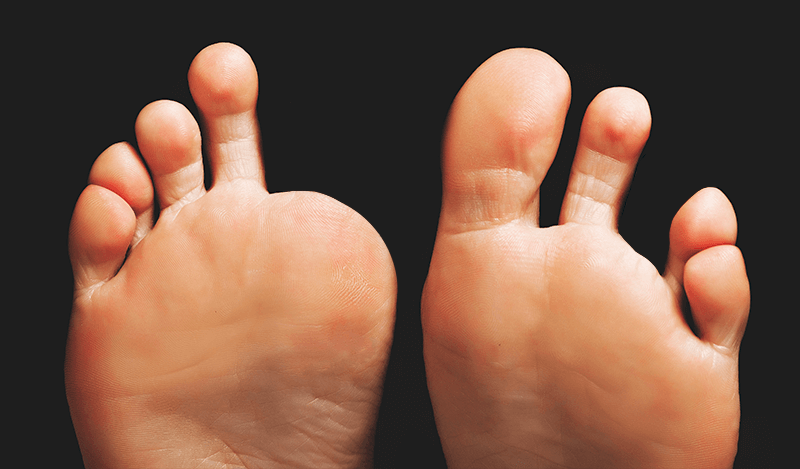 Is chiropody a part of podiatry practice? Yes, it is. What is the Current Training of Canadian Chiropodists? I had to look up what the training of a chiropodist is like in the Ontario province of Canada, the province where Toronto is, where Jonathan Tomines practices. This page of the Ontario Podiatric Medical Association, entitled, “Podiatry and Chiropody”, states that “The majority of chiropodists currently practicing in Ontario hold a post-secondary diploma in chiropody, although many also have some university level schooling or a baccalaureate degree in the sciences or in another field.” Some have university level schooling or a college degree? That’s not very reassuring. The predominant podiatry school in Ontario province, the Michener Institute, currently is a three-year program that grants an “Advanced Diploma”. This is not a doctoral level program, so not to split hairs, chiropodists like Jonathan Tomines are not doctors by the technical definition. He has no letters after his name. But he does play one on A&E. In contrast, there are many DPMs who graduated from American podiatry schools who practice in Canada, many of whom did hospital based residency training programs - particularly out West in Vancouver and Edmonton. Chiropodists are not doctors by the technical definition. As we’ve evolved as a profession here in the U.S., we have become stratified as far as our focus, with most podiatrists in some kind of general practice (let’s say 80%) and a smaller number being advanced surgeons (let’s say 20%). I wonder what our advanced surgeons do when a frail elderly diabetic patient with poor circulation presents to their office with long thick nails that hurt? Do they refer them out, or do they, like Jonathan Tomines, take 20 minutes to slowly and meticulously debride their nails to give them the relief and safety that they seek? Do they do chiropody? In fact, this is what these patients need to maintain good foot health. If it is chiropody, that is a part of modern podiatry practice, too. Will The Toe Bro Show Hurt or Harm the Reputation of American Podiatrists? The Toe Bro series has a high enough media profile that I believe it will have an effect on the public perception of podiatry, perhaps less than the Seinfeld episodes that raised questions such as “Are podiatrists doctors?” because that show was watched by everyone, while this is one of many A&E shows among many channels. Honestly, Seinfeld both helped and hurt us, which is ironic because I know he is actually a big podiatry supporter, having received successful care for plantar fasciitis. 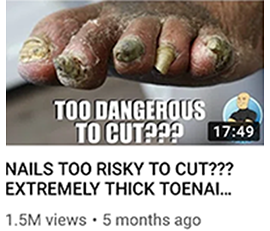 As for The Toe Bro show, I have some questions - Will viewers be able to distinguish between American podiatrists and The Toe Bro, between modern foot physicians/surgeons and Canadian chiropodists? My opinion is that most won’t. Unless you’re really looking for it, the show doesn’t tell you that you are viewing a Canadian experience being performed by someone who is not a doctor. To those that have had no prior experience with podiatry, THIS WILL BE their impression. They will think this chiropody is all that we do. In that respect, the show will harm our reputation. Of course, we are becoming better known by people in the know, who know that not all podiatrists have the same skills. With the addition of a few advancements (a hyfercator, sterilization of all instruments, disposable syringes) Jonathan Tomines is practicing today what was the standard for American podiatrists 50 long years ago. On the other hand, he is a kind, compassionate man that is not without skills, whose patients are grateful for his care on their behalf and think he is a hero. Many viewers won’t be able to distinguish what this chiropodist does, and what American podiatrists do. What they see in The Toe Bro will be what they think foot specialists do. That is unfortunate, because we do much more. The reality is, we do much more than this guy. We cover a much larger part of the public health needs than chiropodists do, even as they have advanced to today. We cover the foot and ankle as a medical specialty in the United States. We podiatrists just aren’t as homogeneous a group as some of us might like us to be. Me, I don’t think anything, not we as a profession, nor the public health, benefits or is in any way improved by all podiatrists being exactly the same. I think that the diversity that exists within podiatry does benefit the public health and podiatry as a profession. As a profession, we entirely cover the foot and ankle. We just don't ALL cover all of it. And nor do we all need to. As a profession, we do much more than this guy. We entirely cover the foot and ankle. We just don't ALL cover all of it. And nor do we all need to. I think that the diversity that exists within podiatry does benefit the public health. Here’s an idea. We are all podiatry sub-specialists. All podiatrists practice their own specialty, their particular part of the whole that is podiatry, and they’re all important to the public health. Our advanced surgeons. Our general practitioners. Our wound care/limb salvage specialists. Our palliative care experts. I sure never looked down on my internist friends for being general practitioners. No podiatrists, no matter what extra training they get, should feel superior to those that run good general practices. I know I don’t. No podiatrists should feel superior to those that run good general practices. I know I don’t. It’s really up to us, as a profession, to teach the public about all the advances that we’ve made in those 50 years. To teach them to distinguish between what The Toe Bro does and all the rest that modern American podiatrists do. To the extent that they don’t know that we train alongside other medical specialists for three years, that some of us handle major trauma, do limb salvage, fly to Vietnam, Baja and Honduras where patients line up to have us do major foot reconstructions, we need to publicize that more. We do medical support for sports events, there are even a lot of us now that take part in the management of hospitals, as thankless committee members and officers and even as management. My good friend Richard Reuter, DPM manages a medium size multi-specialty practice. My feeling is that we don’t disparage The Toe Bro. Let’s admire his valuable work, let’s embrace chiropody as one small part of podiatry and enjoy the attention that Jonathan Tomines has captured for foot care and continue to improve the way that we ALL serve ALL of the foot care needs of the American public. Stay tuned next week for a review of the brand new TLC Channel series My Feet Are Killing Me, another reality series that features two well trained foot and ankle surgeons from Orange County, California, Ebonie Vincent, DPM and Bradley Schaeffer, DPM, as they present a more modern, surgically focused view of current podiatry practice. I have known about the reduction of the D.P.M. s in Canada for a decade, since my medical school roommate in Cleveland in the 1960's was from Toronto and is a past president of the Canadian Podiatric Medical Association. It's too bad there won't be any positive images for the doctoral profession in the USA. The Chiropodist is a good impression for the general title of "Foot Specialist ", which is how Jonathan introduces himself. Too bad he couldn't be sharing his office with a Board Certified, Podiatric Surgeon, to whom he could refer deformities he couldn't treat. Instead I fear this sets the Podiatric Profession back to the "chiropodial days". As a retired Army surgeon (25 yrs), a retired private practitioner ( 35years in Orange County California) & a retired VETERAN ADMINISTRATION surgeon (20 yrs), I am disappointed, to say the least. I will continue to watch, but it will get very boring within a few SHOWS, duplicating the same problems, OVER and Over. Tim Byron, DPM, MS, D,ABFAS,F,ACFAS, F,AAPSM ,F,ASPS, Retired, USAR, LTC, PAST, CHIEF, VA. I have not seen the show. I love what you wrote and agree 100%. I feel this will most certainly harm the image we all have worked so hard to develop. As one who started when the image of podiatry was very poor and to see us now…..truly a valuable part of the medical team – equal in “statute” to all other specialists. Personally, I will not watch this show as it will depress me. I wish we could come up with some public statement. What that statement would say is above my pay grade. There's also a new show on TLC that is about to start called "My Feet Are Killing Me." 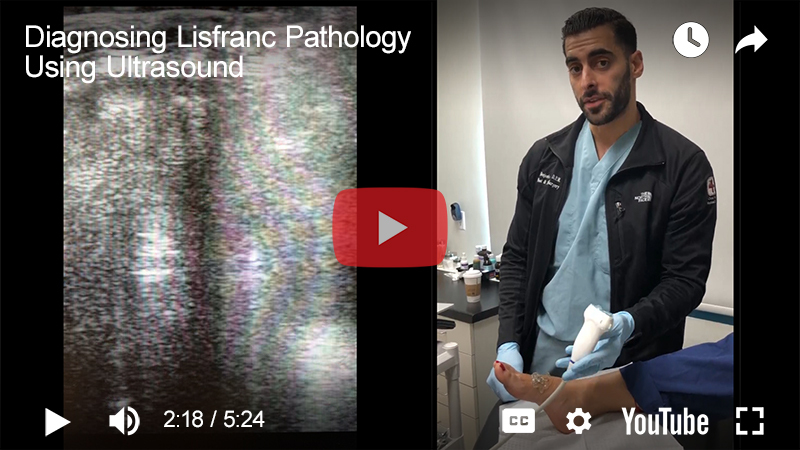 It's about a couple of young podiatrists in practice in Orange County near where I live. I’m planning to try to get in touch with one of them for an interview. I just read your post, and as always you provide a clear and nuanced view of the issue. I agree with everything you said (especially after watching a couple of his videos). It's hard to see how anyone could get so many shows out of toes and toenails, especially when there's so much more to the profession. I'll be interested to hear your thoughts on the upcoming TLC show featuring 2 actual American podiatrists who do surgery. From the little I've seen of that show it'll have a bit better potential impact though I'm sure that "grossness" factor will be there albeit to a lesser extent. Thanks for sharing!